Red Heart Hygge Charm features a variety of colorways, from soft pastels to jewel tones, there’s even a hot pink! These 16 colorways all have the best astronomical names. And the balls are all a generous 7 oz – over 400 yards! Hygge Charm is a “brushed yarn with a touch of metallic shimmer that combines comfy with glamour perfectly” – love that description from the Red Heart site, and it’s so true! 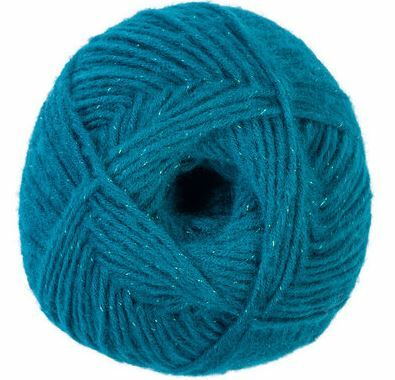 This yarn is perfect for anyone who wants to sparkle. 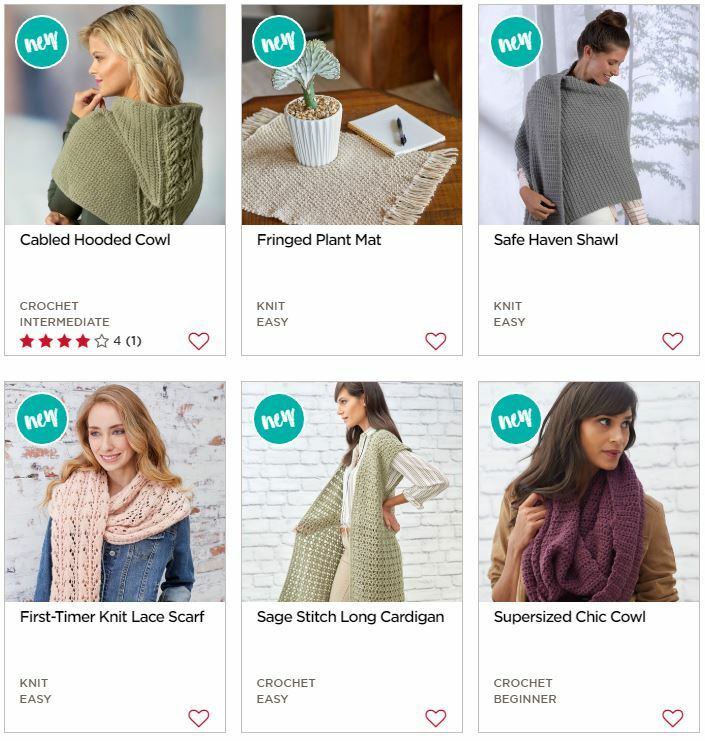 And I’m excited to announce that tomorrow is the first day of the December 2018 Furls Crochet Along – and I’m the designer! And… drumroll please… the pattern is made with, you guessed it, Red Heart Hygge Charm! UPDATE: Due to technical surprises, the CAL is being delayed by one week. Watch for Part One on December 11th! That’s not all though – as you may have spotted on my most recent Lives, I’ve designed a cardigan with this yarn too – the Cosmos Cardigan! 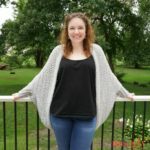 You can buy Red Heart Hygge Charm right from RedHeart.com, and it’s online at some big box craft stores and Amazon US – I know it can be hard to order yarn un-felt, but I really think you’ll love this one! And to give you an even closer look, check out the Yarn Love yarn review here on Moogly too! But now… let’s get to that giveaway! 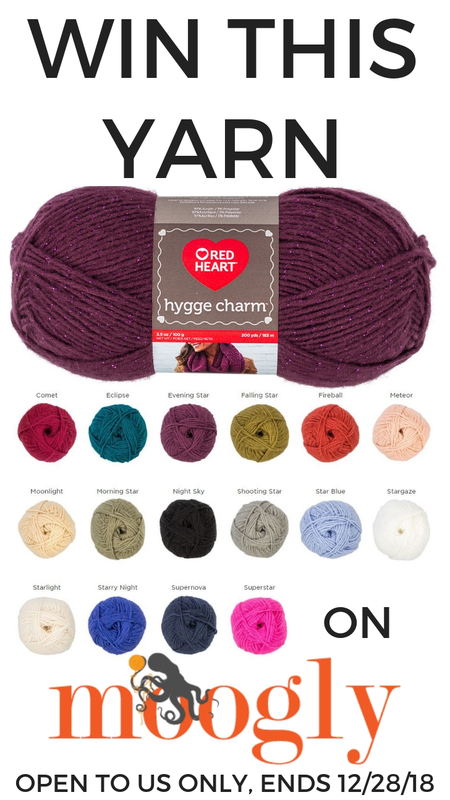 For this Red Heart Hygge Charm Giveaway, you can win 5 skeins of this yarn in your choice of color(s)! 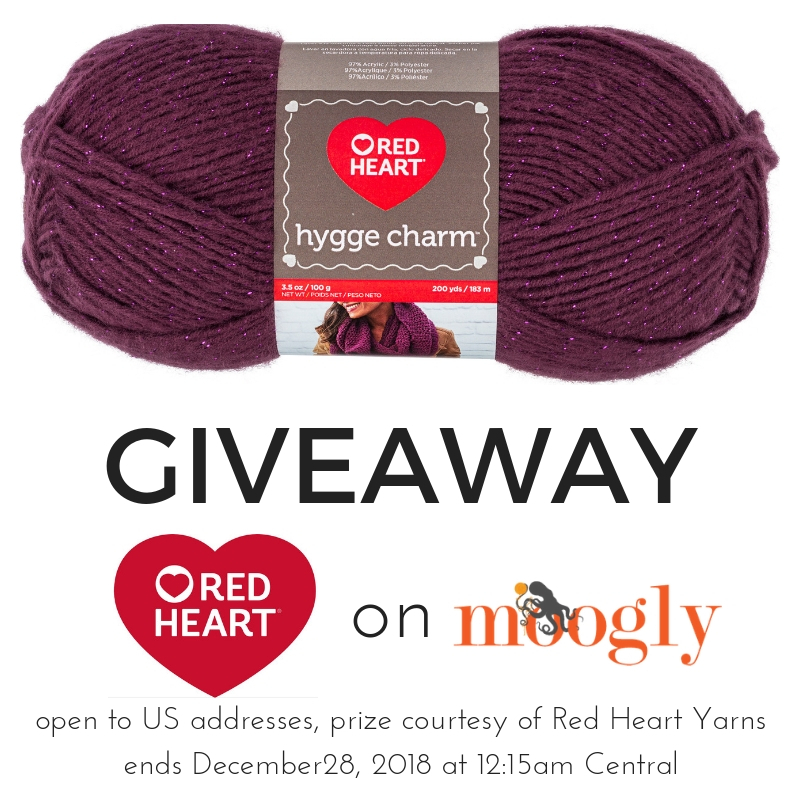 The Red Heart Hygge Charm Giveaway is open to US addresses only (void where prohibited) and ends December 28, 2018, at 12:15am Central US time. To enter, use the Rafflecopter form below. If you are on mobile and have difficulty entering, please use a desktop computer to enter. Only the email option is mandatory – all other tasks are optional, for bonus entries only. 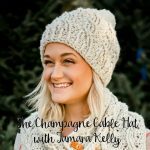 Furls December CAL: The Champagne Cables Hat! I’d love to try this Hygge yarn. Thanks for the chance to win some. P.S. I don’t use Twitter and I saw a survey the other day (can’t remember by who) but it seems a lot of “hookers” don’t use it. Just thought I’d pass that along. Beautiful yarn, thank you and have a nice day! I think someday, I’m bound to win! Maybe it will be THIS TIME!! I would love to try this yarn and I think that someday I am bound to win! P.S, I don’t use Twitter and I saw a survey some time ago that said a lot of hookers don’t use it either. Thank you for a chance to win. The yarn looks beautiful. Beautiful Yarn! My imagination is exploding with ideas for it. Beautiful yarn! Very generous of you. So exciting! 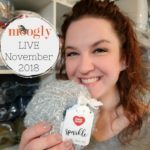 I would so love to try out this new Hygge yarn especially since I think Santa might be bringing me new hooks for Christmas! I couldn’t think of a better yarn to break them in on. Fingers crossed. This yarn looks gorgeous! Thank you for the giveaway! Thanks for the Chance to win this yarn. I love the names of the colors. I really like Eclipse. Good luck everyone. Lover the colors and feel of this yarn! My favorite is meteor. Thank you for this opportunity! Would love to try this yarn and I love the sweater pattern. I’ma big fan of red heart soft – this looks lovely, especially the starry night! Thanks for the opportunity to win some. I love Red Heart Yarns!! I would Love to win this yarn. Thank you for the chance to win this yarn! Absolutely loved vet this yarn! 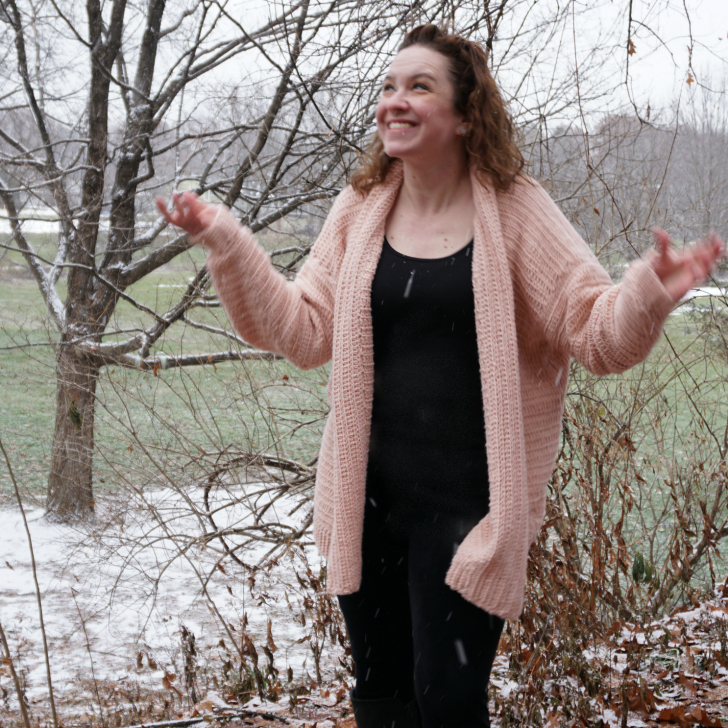 Have started the So Comfy Sweater and plan on making more, So soft and cozy. 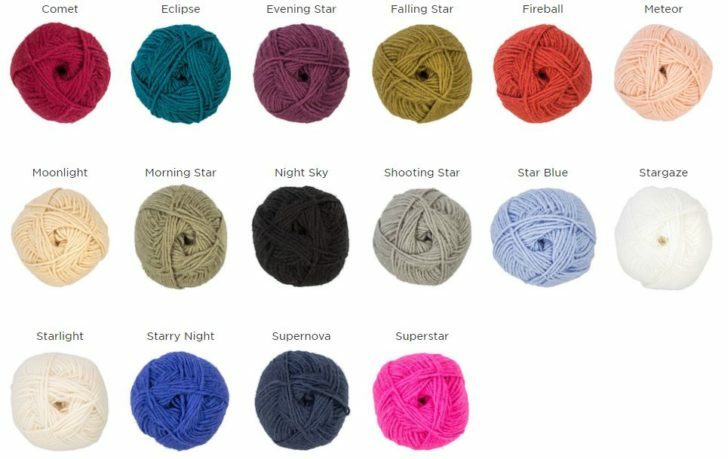 I’ve already picked out the color to make my daughter the Cosmos cardigan. She is starting her job as a 2nd grade teacher in January! I love this yarn… would like to get my hands on it. I’ve never won anything before but maybe this time i will… best of luck to all who have entered to win. I haven’t tried the sparkly Hygge yarn, but I have tried the regular Hygge yarn and it is yummy. It is easy to work with and is soooooo soft it feels like a cloud. Wonderful yarn. Anyone who wins this will be thrilled! !